As most people would have noticed, I’ve been conspicuous by my absence recently. This has been due to a couple of things that have been happening IRL, and has made my spare time pretty much non-existent. Unfortunately for me, that spare time was the time I was using to do FreePBX work. Luckily, one of the good things about having a successful Open Source project is that it’s pretty much impossible for a well-used piece of software to become ‘Abandoned’, because there’s always someone who is willing to take on the task of looking after it. In this case, Philippe has agreed to take on the mantle of becoming the project steward, and will be running the project from hereon. While he’s doing that, I’ll be keeping an eye on what’s going on – but not in any managerial capability whatsoever – whilst I carry on with real life. I still have a couple of customers that I’ll be doing FreePBX work on, so you may occasionally see a commit from me now and then if I find any buglets. But mainly I’ll be working on my day job, which these days consists of trying to keep Card Xpress machines running throughout Queensland and NSW. 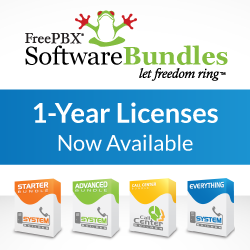 As of now, I’m officially not doing any FreePBX support, and the ball’s totally in his court. I’d like to wish him the best of luck with FreePBX, and I hope the project prospers under his leadership!